“Why are the trade unions in Singapore so weak?” I asked NTUC Chief Lim Swee Say. One of the benefits I get as a blogger, is that I get to meet important people all the time. On this occasion, I had the pleasure of meeting Mr. Lim Swee Say, the Secretary General of the NTUC. Before meeting him, I Googled about trade unions in Singapore. I found this Japanese website talking about “benefits of doing business in Singapore”. There are the usual low corporate tax, efficient system, great human resources… nothing surprising to me, but what I found at the very end was rather shocking. It said: “Weak trade unions”. The business consultant who wrote the article was actually telling Japanese people to come do business in Singapore, because the trade unions here are so weak there’s nobody to keep them from abusing their workers. Is this true? Therefore, I asked Mr. Lim Swee Say, the Secretary-General of NTUC, what he thought about this phenomenon. “I guess many people in this world are thinking that strikes are the strongest weapon we workers have and must make use of it”, I said. 1. 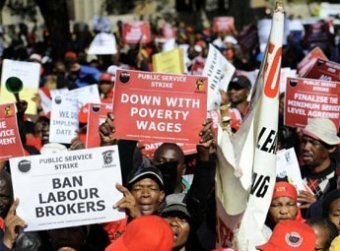 Strong trade unions do not need strikes. “If you can get what you want without going on strike, would you go on strike? Singapore’s unemployment rate is very low and average salary is increasing. 2. Singapore unions can still go on strikes. in most countries, it means you are out of luck. You have to give up work and wait for the strike to be over. In Singapore, we think this shouldn’t happen. 3. Our unions are not big. But they are efficient. 4. The membership is growing. “We have more and more union members every year. You cannot judge our union strength by number of members, but because of this increase, we can be stronger in negotiation and get more results for our workers. We are active. We are growing. I thought I should tell my fellow Japanese businessmen they would be very disappointed if they ever expect Singapore’s trade unions to be weak and quiet. The unions come after you in the most efficient manner to make sure workers are treated well. But after the dialogue, Mr. Lim whispered to me with his cheeky smile again. You guys have the coolest labour chief, I must say. » Banning salary negotiations the way to end gender discrimination? » So you wanna run a tech startup?